Community members will get the opportunity to offer feedback on three developments coming to the Two Bridges waterfront. LOWER EAST SIDE — The Department of City Planning has agreed to delay the start of its official review of a trio of controversial skyscrapers slated to rise on the Two Bridges waterfront after elected officials urged the agency to release a set of documents on the developments in Spanish and Chinese languages, and to then provide more time for non-English-speaking residents to review the papers. Councilwoman Margaret Chin and Borough President Gale Brewer announced Monday that the city will delay the scoping hearing for the three developments by about a month, pushing it from April 27 to May 25. The announcement of the new date — which was published in English, Spanish and Chinese languages — comes roughly a week after the officials had prodded the agency for translations of several documents detailing the areas to be evaluated during its review of the proposed towers and their potential impacts on the surrounding environment. Those documents, the draft scope of work and the Environmental Assessment Statement, were published in English but not in Spanish or Chinese languages, leaving many residents of the Two Bridges area in the dark, Chin and Brewer argued. The officials praised the decision by DCP, saying that translated materials and an extended timeline would allow residents to better engage in the public review process. It wasn't immediately clear how many of the documents would be translated. Neighborhood leaders in January demanded the developers delay the April scoping hearing until September to allow more time for meaningful community engagement. That demand was echoed by elected officials, but was twice rejected by the developers. Community members have expressed anxieties about the three towers planned to rise within a three-block radius, fearing the impact the collective developments will have on their quality of life. 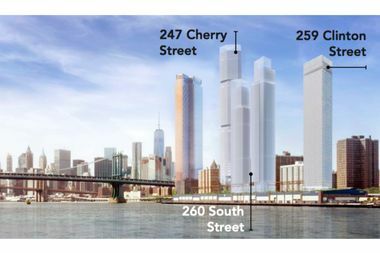 JDS Development Group plans to build a 77-story tower at 247 Cherry St., while Two Bridges Associates plans two towers on a shared base at 260 South St. and Starrett Development is planning a 62-story residence at 259 Clinton St. The Department of City Planning had not yet published translations of the documents Monday afternoon, and did not immediately respond to an inquiry on whether all documents would be made available in the requested languages. Representatives for all three developers declined to comment on the decision. The public scoping hearing will take place at the Municipal Building, 1 Centre St. on May 25. There will be two sessions where members of the public can provide feedback on the plan — one at 2 p.m. and one at 6 p.m. Written comments will be accepted through June 8. For more information, visit the Department of City Planning website.